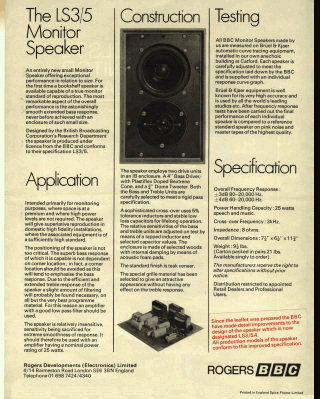 The prototyping work for the LS3/5 (without the "A") was done in-house by BBC Research Department at Kingswood Warren. The work was based on Research Department's acoustic modelling work. For a full account please see The Little Legend. 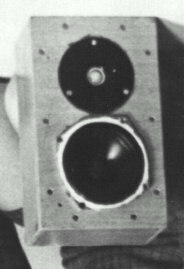 The BBC made about 20 pairs of LS3/5s in house and put them into service in television outside broadcast vans before they invited outside manufacturers to apply for a licence. 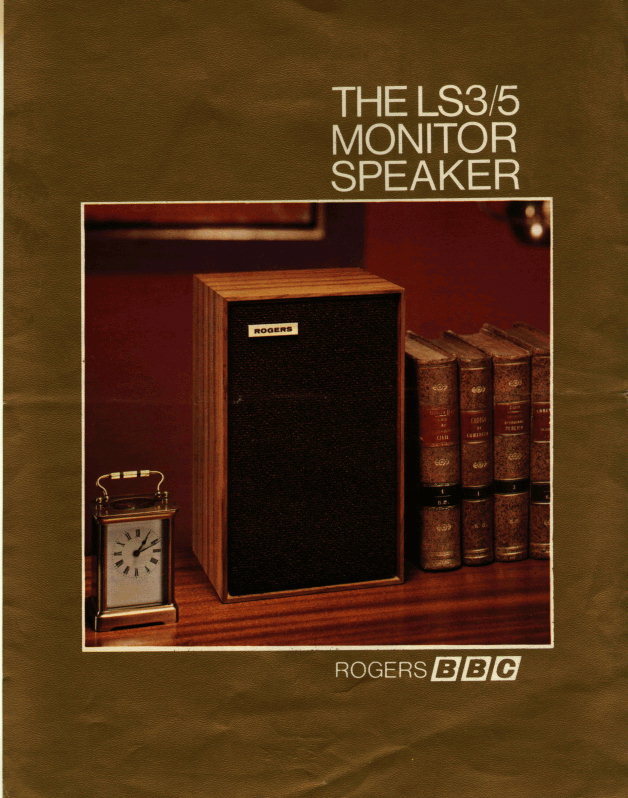 Rogers (under Jim Rogers) intended to manufacture the speaker and issued a press release in February 1974. Click on the images for a larger picture. The LS3/5 has the B110 at the top and lacks the tweeter protection grille and felt surround of the LS3/5A. The LS3/5 was developed by BBC Research Department at Kingswood Warren. The design was fine tuned by measuremant, by compasison with the LS5/8 Grade A monitor and also with live sources including orchestras. As a result the development costs were very high and a figure of about £100,000.00 has been often used as an estimate. At 2011 values this is equivalent to between one and two million pounds sterling! 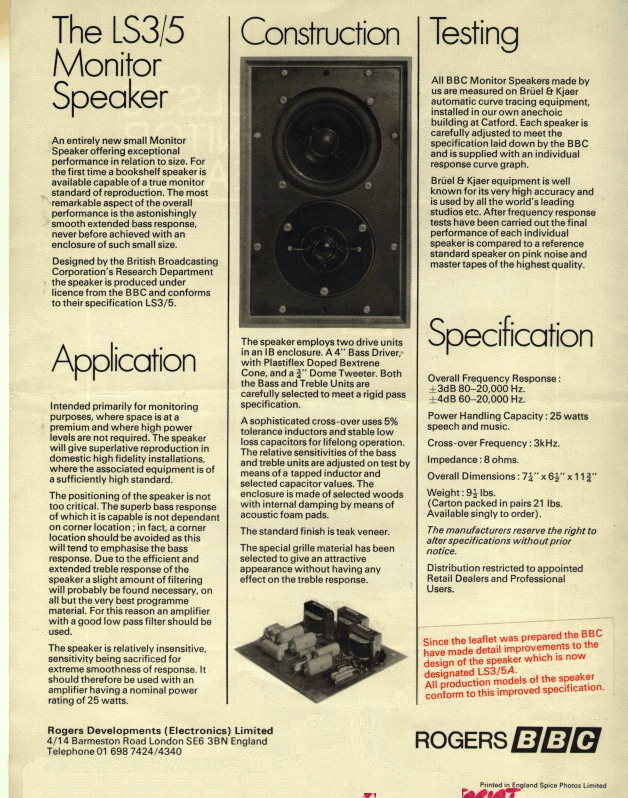 Jim Finnie who worked at Research Department told me that the design team would often argue for a week over a change to the speaker that resulted in a 1dB change in its response. No commercial manufacturer could hope to compete with these kind of development resources and this is one reason that the design has been so highly acclaimed. Several of the staff were very enthusiastic about the project and built their own pairs, fine tuning them for best performance. In addition the department made some pairs for use as references in house. 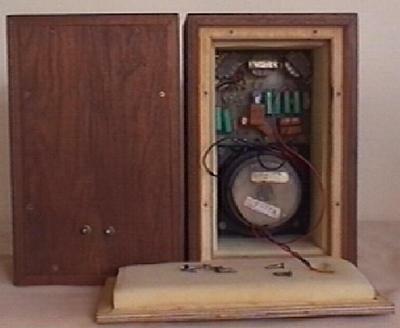 These can arguably be considered the unlimate small monitoring loudspeaker, they were so finely tuned. 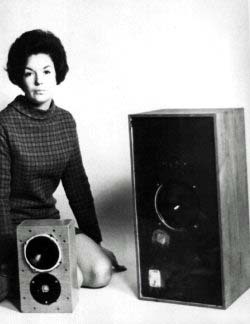 Indeed the very tight tolerances required would prove a problem when it came to putting the speaker into production. 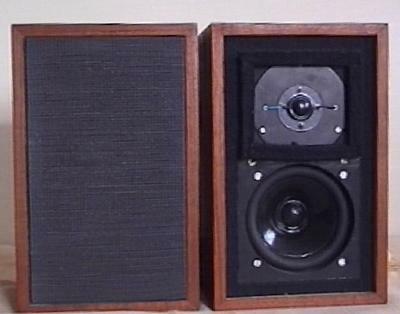 Jim Finnie has a pair of these very special loudspeakers. They can be considered the ultimate LS3/5As because they came out of BBC Research Department and do not contain the modifications introduced later by BBC Design Department. The drive units were highly selected and because of this the crossovers contain fewer components. Jim was one of the staff who bought the parts to make his own pair. 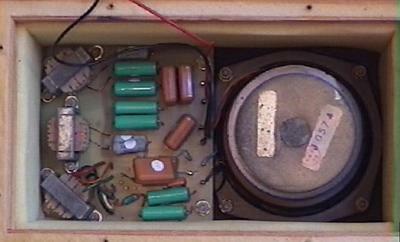 Jim's speakers were built with the help of the expert technicians at K.W. having heard them I can confirm that they are absolutely superb. I am indebted to Jim Finnie for allowing me to use the photographs of his KW LS3/5As.